Lydia wrote this post and my hilarious yet informative quips will appear in [brackets]. Last night we stayed in a very unique Airbnb. It was a one room stone cottage without central heat, and it was cold! Good thing we were only there for a night. Once inside the walled-city of Obidos, we noticed every shop was selling the same thing, cherry liqueur[ginja] in chocolate shot glasses. Of course we had to try some. It’s just as delicious as it sounds. We also bought a couple of egg tarts, Portugal’s breakfast of choice. Obidos is a picturesque town with cobblestone streets and whitewashed buildings. I’m not sure why, but there were a ton of school groups visiting Obidos. As we wandered, we happened upon a building with a free nativity scene, so we went inside to take a look. The artist, who seems to struggle a bit with perspective (there was a gigantic squirrel in the upper lefthand corner), was hanging right outside the door. On our way out, John noticed steps leading up to the town walls, so we climbed up for some scenic views. On the way to our next destination, we stopped by a grocery store hoping to find some cherry liqueur to take home. Not only did we find cherry liqueur, but also port, brandy, and some road snacks. Driving through Portugal has been a breeze. The roads are smooth and well marked, there isn’t much traffic, and the views out the window are nice too. A while later we landed in the town of Sintra, a half-an-hour outside of Lisbon. Quite a few places in Sintra piqued our interest, but we only had time for a few. We started with lunch at Dom Pipas. I had an excellent shrimp and octopus dish that I washed down with Vinho Verde. Vinho Verde, although directly translated to green wine, is a Portuguese specialty made with young grapes. It can be red, white, or rosé. Next we drove up the hillside to the Palacio Nacional da Pena. Originally the sight of a monastery, King Ferdinand had the castle built in 1854. With it’s bright colors, tile work, and funky shapes, it’s like something out a fairytale. The gardens surrounding the palace are nice too! Unfortunately, we didn’t time this day very well, and we ended up driving to Lisbon in rush hour traffic. What should have been a 30 minute drive, ended up taking over an hour. Whoopsies. After dropping our bags at our apartment, we headed out on the town. We popped into a Christmas market and sipped mulled wine while shopping for ornaments made of cork. We also browsed a couple of dollar store places. The dollar stores here are a bit more interesting than ours. Tins of fish are all the rage in Portugal. Of course we had to stop when we passed a store that’s sole product was tinned eel. We had some drinks at a medieval themed bar called Trobadores. 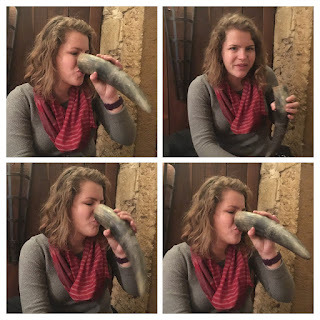 It was so authentic, we drank out of horns! Next we walked past Praça de Comércio and admired the Christmas tree. It was festive. John wanted peri peri chicken for dinner, so we ended the night at Bonjardim in the Baixa neighborhood. Maybe you’re familiar with the restaurant chain Nando’s that sells peri peri chicken. Well we were under the false impression that Nando’s is a Portuguese chain, but it turns out it was actually created in South Africa. I am spending my day reading your blog and enjoying every minute. Great pictures and videos! I love entering contests - so I couldn't resist.